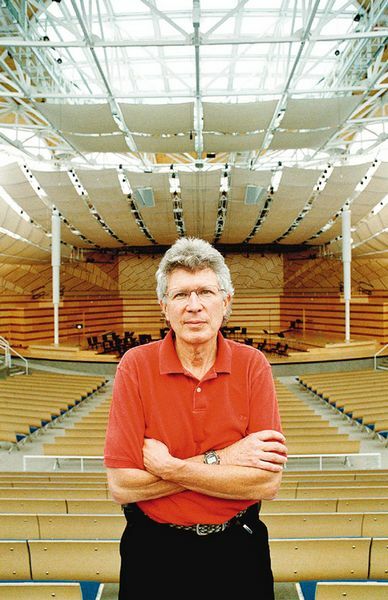 Aspen Music Festival and School director Don Roth in the Music Tent during the 2002 season. Aspen Times photo/Paul Conrad. Don Roth, president and CEO of the Aspen Music Festival and School, will leave his post next March, according to a statement released by the festival yesterday. The announcement ends months of speculation about Roth’s future at the organization, which is best known for its internationally renowned summer classical music festival. Roth, whose contract was up for negotiation on March 19, signed a new, one-year deal with the festival but confirmed he would leave when it expires. Roth could not be reached for comment yesterday, but in a prepared statement released through the festival, he said he is looking for professional opportunities elsewhere. “On a personal note, as much as I love this organization and community, I am looking forward to fulfilling a long-term dream of returning to my roots in one of my two hometowns ” New York City, my birthplace, or Austin, Texas, where I spent my formative adult years and began my career in arts management,” the statement read. Joan Harris, who heads the festival’s board of trustees, said the board unanimously agreed to Roth’s final, one-year contract at a meeting Saturday. “I think Don is ready to move on to the next state of his life. We’ll find someone to come help us run the festival. But personally, I’m very sorry he’s going,” Harris said. Harris declined to comment on rumors of conflict over Roth’s future within the board of trustees. “The important thing is that we move forward and that the festival has survived,” she said. Roth took over the festival’s helm from popular CEO Robert Harth in November 2001. Roth’s previous experience included heading various symphony orchestras, most recently in St. Louis. In yesterday’s statement, the festival credited Roth with continued improvements in Aspen, including a balanced budget and broad artistic success. In the statement, Roth also said he was proud of his tenure. “My goal was to leave the institution even stronger than I found it. With the help of a wonderful team, we have accomplished this in the quality of our students and their satisfaction with their experience at the AMFS, the artistic rewards found by our audience, our even stronger connection to our community, an enhanced national reputation, and a financial base that is stronger than ever,” Roth said.